Fentanyl is an opioid pain-killer in the same class as morphine or Demerol, meaning that it acts on the same receptors in the brain to lessen the subjective experience of pain. It appeared on the market in 1960, and quickly gained wide use in anesthesia practice. 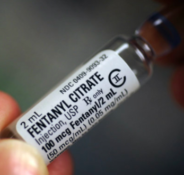 Fentanyl is potent and works fast, which makes it very effective in treating the intense stimulus of surgical pain, and its peak effect lasts only a short time. It’s also inexpensive, which makes it attractive in an era of cost containment in healthcare. When I started my anesthesia residency, we assumed that since fentanyl’s analgesic and euphoric effects were so brief, short-term exposure to the drug wouldn’t increase a patient’s risk of long-term narcotic abuse. For the first few years, fentanyl was kept in unsecured medication carts in the operating rooms along with Benadryl, lidocaine, and other commonly used medications. But anesthesiology departments quickly learned that fentanyl did indeed have high abuse potential. Its pleasurable “high” and rapid onset proved irresistible to some people, and deaths from overdose occurred all too often among medical personnel. Now, we track every microgram of fentanyl used or discarded during surgery. Fentanyl stayed quietly under the radar for decades as an IV drug useful primarily in anesthesiology practice. But it began to see more use in the treatment of chronic pain — as transdermal patches, or “lollipops” for absorption by mouth. And with its increased availability came a higher risk of abuse. The well-publicized death of the musician Prince in 2016 from an accidental overdose propelled fentanyl into fame. Today fentanyl is making headlines as the drug responsible for an ever-increasing number of opioid overdose deaths. Cheap to synthesize, it’s being laced into heroin and illegally made into pills that look just like oxycodone. People don’t have any way of knowing how much they are taking, and they die because they stop breathing. Of course, illegal fentanyl abuse is the polar opposite of administering fentanyl responsibly as a licensed anesthesia professional who is monitoring the patient’s every breath. But we’ve learned that opioids, even when legally and carefully administered with the best intentions, may have unintended consequences. The key fact, often poorly understood by physicians — let alone the general public — is that treating pain with opioids can lead to more pain, a phenomenon known as “opioid-induced hyperalgesia”. This is different from tolerance to the pain-relieving effects of opioids. Most people understand that if you start taking any narcotic — whether morphine, oxycodone, or fentanyl — over time you will become “tolerant” to the drug’s effect and will need more of it to achieve the same level of pain relief. Opioid-induced hyperalgesia, or “OIH”, is a different problem. The definition of hyperanalgesia is abnormally heightened sensitivity to pain. OIH is defined as hypersensitivity to pain that occurs as a result of opioid use. When surgical patients receive opioids while under anesthesia, several studies have demonstrated increased opioid requirements after surgery, and worse, not better, pain scores. An excellent 2016 review article in the journal Anesthesiology pointed out that the potential onset of OIH “should be considered when opioids are administered” to patients under anesthesia. It may well be that short-acting opioids such as fentanyl are worse offenders in terms of provoking OIH than longer-acting ones, as OIH increases when pain relief wears off and opioid doses must be repeated. Do we need to use opioids during anesthesia? Actually, we don’t. That has been the most surprising fact I’ve learned in recent years, as I’ve modified my practice in light of America’s lethal opioid epidemic. There’s little reason to use fentanyl to block the unconscious patient’s blood pressure and heart rate responses during surgery, or the discomfort of having a breathing tube inserted. Other non-opioid anesthesia medications can do that just as well, without the risk of OIH. In light of all this information, I’m not sure I want my anesthesia practice associated with the use of fentanyl at all. I may be paranoid, but I suspect it’s only a matter of time until some clever plaintiff’s attorney sues anesthesia providers, claiming that a patient’s addiction was spawned by a first exposure to fentanyl during surgery. Who needs that misery? As Joseph Heller wrote in Catch 22, “Just because you’re paranoid doesn’t mean they aren’t after you.” Enough said. New information for this ID doc. Thanks. Pain and fever control with Tylenol or NSAIDS in infections is what we fight all the time as suppression of both gives patients relief and they don’t seek care till late. Especially true in necrotizing soft tissue infections. Although I agree with needing to use less opioids in the OR… You are sounding dangerously like an administrator or a bureaucrat. The opoid epidemic wasn’t caused by physicians directly instead the American pain society in colussion with the joint commission forces the hand of treatment y decisions by making pain the fifth vital sign and the rest is history. Telling physicians that they can no longer give fentanyl is reckless and unwarranted. How many opioids are inexpensive and easy to predict and reverse. Physicians are already overburdened with over regulation. Let’s not add another mail on the coffin. Never do I venture to tell any physicians, other than my residents, what they should or should not do. I agree with you that such broad directives are possible only with the hubris of a bureaucrat or administrator. I simply explained in this post how I have changed my practice and why. Fentanyl and short-acting opioids such as remifentanil do indeed seem to induce OIH to a greater degree than longer-acting opioids such as hydromorphone or methadone. Another fascinating recent study suggests that esmolol, given intraoperatively, may be MORE effective than fentanyl in reducing postoperative pain. Why bother with fentanyl at all? Your article on fentanyl is so disturbing to me…. I’m sry but I have had many surgeries and never felt OMG I addicted!! This thinking needs to stop and this war drugs is now turning into the war pain patients. Chronic pain patient that need these meds to have some kind of quality of life. We aren’t addicts…we are pain patients! I fear that you misinterpret my intent. Nowhere do I recommend eliminating ALL opioids from anesthesiology or pain medicine. I spend my working life treating pain during and after surgery. Long-acting opioids such as hydromorphone are frequently a component of postoperative pain management, whether given intravenously or via an epidural catheter. Of course chronic pain patients deserve the best possible treatment. My post simply discusses how my practice has changed in light of the opioid crisis, and why I have reduced the use of fentanyl in particular in caring for my patients. The fact that you have not become an addict is good news indeed, and I wish you the best of health in the future. Choice of analgesia depends on the type of problem, the duration of analgesia needed, the patient’s underlying co-morbidities, and history of pain medication use. Multimodal analgesia is very helpful. Short-acting narcotics — fentanyl, remifentanil — are not very effective for prolonged postoperative pain. Regional blocks/epidural analgesia may be very useful. A book could be written (and probably has been) on this topic! I am specialist anaestheologist in South Africa.I have been in private practice 20 years. My wife was recently administered this drug when she was getting catherized for dialysis. She had a PROFOUNDLY negative reaction. She hallucinated terribly. She thought she was being taken into a dungeon and became incredibly agintate. I cannot believe it is routinely administered. I will never let a doctor give it to her again.